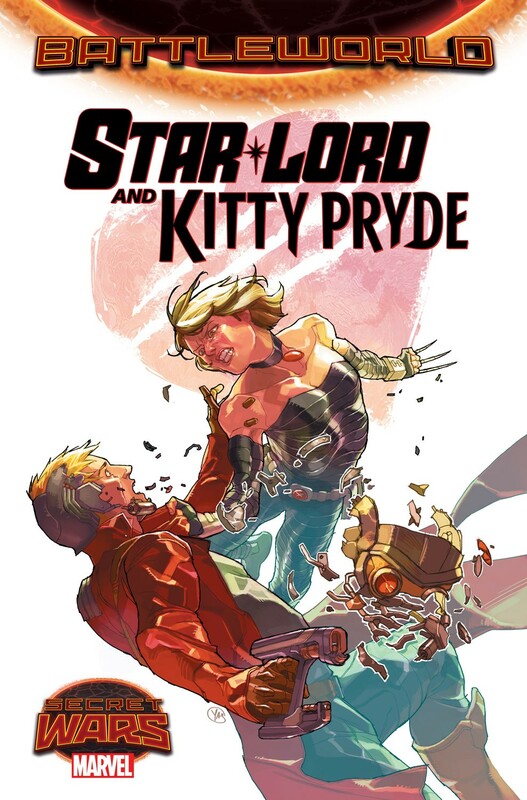 A new Secret Wars tie-in series in the form of Battle World: Star Lord and Kitty Pryde has been revealed. The cover depicts Peter Quill/Star-Lord in garbs we’ve grown familiar with, but the woman attempting to stab him with Wolverine claws might be unfamiliar to casual readers. This is the Age of Apocalypse’s version of Kitty Pryde/Shadowcat. Hailing from a reality in which Magneto runs the X-Men in honor of his departed friend Charles Xavier, Kitty was trained by Weapon X (James Howlett), who never took on the codename Wolverine. The set of claws she bares was also a gift from her mentor. Due to Earth-616’s version of Kitty Pryde and Star-Lord still engaged with the events seen in the Black Vortex run (which involves both the Guardians and X-teams), there’s no saying where the two will stand by the conclusion of the event in April. Battle World: Star-Lord and Kitty Pryde will be tackled by current Legendary Star-Lord writer Sam Humphries and art by Alti Firmansyah. Yasmine Putri provides cover art for issue 1. Star-Lord and Kitty Pryde issue one hits local comic shops in June. Marvel has granted Comics Alliance an exclusive interview. To check it out, click here.